Tweak the words – double your income ! It was a subtle change of language – a tweak of her words and the online audience she was targeting. It doubled Tauranga glassmaker Jo Tricker’s income in a year. 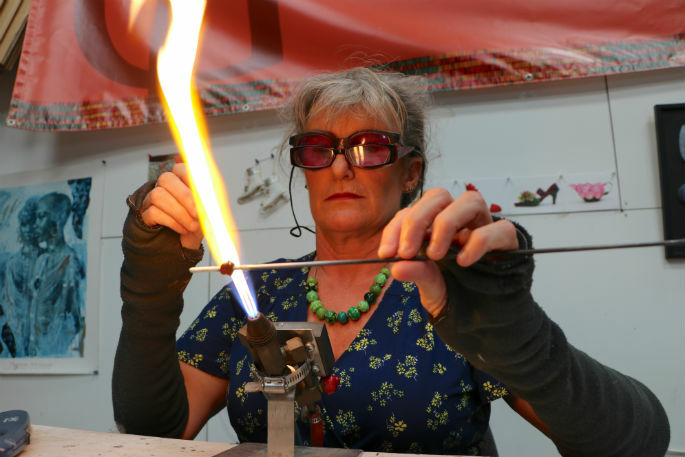 After swapping ideas with a business mentor, Jo’s glassmaking workshops at her Judea studio were re-labelled “experiences” in her internet promotions. “Yes, people wanted an ‘experience’ rather than a workshop or a class, even though they may seem like exactly the same thing,” she says. Jo claims it’s all about perceptions. “People perceive an experience to be fun – something they haven’t done before, something they might enjoy. This approach is in opposition to a class or workshop, where someone learns something and takes away skills for further use. Jo feels she has finally turned a corner. “Last October I was still questioning myself. Now I feel like my business has the potential to be something.” She attributes that turnaround to a combination of new ideas, advice and support from business mentor Bryan Winters. Jo is one of hundreds of New Zealanders who, after turning their passions and hobbies into a business, are faced with the realities of running that business successfully. At present, there are more than 500,000 small-to-medium businesses, with 850 new start-ups every month. Unfortunately, 30 per cent are doomed to fail within two years. Isolation, or lack of support, is one of the main reasons. Like many SMEs, Jo Tricker Glass became a business when her “hobby” outgrew her garage. “I started up my business because of my passion,” she says, “but I had no business experience whatsoever. Having Bryan to reassure her that she could learn the required business skills was invaluable. “You need to be open to other ideas, and also to the fact you might fail,” she says. So, when Bryan suggested marketing her classes as “experiences” rather than lessons or workshops, Jo took the opportunity. Bryan says the process to get to where Jo is now sounds simple, but it took months to shift her thinking patterns. “We were firing shots in various directions, but eventually it became easier to sell the experience rather than the product,” he says. Once Jo listed her workshops online as experiences, he says the bookings started almost immediately. Half of Jo’s business is now dedicated to her glassmaking workshop experiences, while the other half is spent making her own creations for sale throughout New Zealand. Now the mentored becomes the mentor. Jo has her own tips for start-ups. “Never underestimate how much money you will need to get you from zero to sustainability,” she says. “Work out how much you think you will need for a year – then triple it. Most businesses I talk to seem to turn a corner in the fifth or sixth year. “Be prepared for a long and sometimes lonely journey – not everyone will believe in what you are doing. You need oodles of resilience, a great work ethic and buckets of self-belief. https://letslearn.co.nz/wp-content/uploads/2019/04/Jo-Tricker-Glassmaker-e1554584624554.jpg 100 150 Shelley Dean https://letslearn.co.nz/wp-content/uploads/2016/08/Lets-learn-Logotype.jpg Shelley Dean2019-04-07 09:07:062019-04-07 09:07:06Tweak the words - double your income ! Bethlehem Pottery Club, where potters create! Liz will teach you from scratch or help those with some knowledge to reach their full potential. This group meets on Thursday mornings. Starting with plain white china and painting designs on it. The possibilities are endless. The china is then fired in a kiln and this takes the paint into the glaze on the china where it becomes permanent.